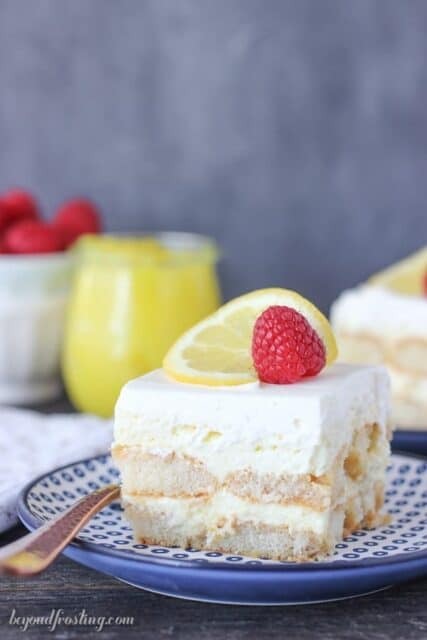 This No-Bake Lemon Macaroon Cheesecake is layered of golden Oreos, coconut cheesecake, lemon curd and whipped cream. 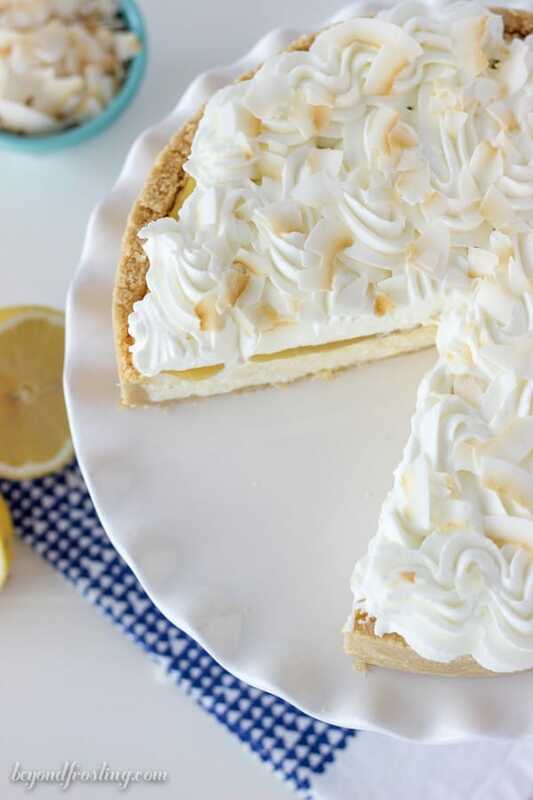 The combination of the coconut and lemon is undeniable! All of this is done without turning on the oven! Recipe from the No-Bake Treats Cookbook. It’s here it’s here it’s here!! Yesterday was the OFFICIAL release date for my cookbook, No-Bake Treats!! I am beyond humbled by all the texts, Facebook messages, Instagram shares and all the love that you guys are sending my way. Lots of you got your book yesterday, and even more of you will be getting your books within the next week. The funny thing is, during the months leading up to the actual release day, I would get sales summaries and although I knew people (like you!) were purchasing my book, now to actually see you holding a copy of my cookbook really makes it hit home for me. I would love to see you pictures! Make sure to tag me @beyondfrosting on your social media or use the hashtag #beyondfrostingcookbook so I can take a peek. This book is FOR YOU!! There would never be a book if it wasn’t for you , my readers, coming back day after day, pinning my recipes, actually making my recipes, leaving comments, liking my posts and reading my stories. So thank you thank you thank you for being there for me. 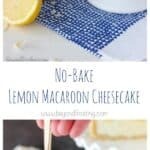 So before I get into this Lemon Macaroon Cheesecake let me tell you a little bit about my cookbook, No-Bake Treats. I know you guys have already seen my QVC video, and you might have even see my pre-sale announcement, but since it’s finally HERE, I want to make sure you know what you’re getting. So where can you actually buy it? Amazon , Barnes and Noble , Indie Bound, Books- A- Million and wherever books are sold. If you follow me on Instagram you will see that last night I was preparing multiple recipes from my cookbook into bite-sized treats to share with my co-workers today. I even made my favorite Banana Split S’mores Parfaits (in a 2-bite size, you guys I can’t even handle the cuteness). 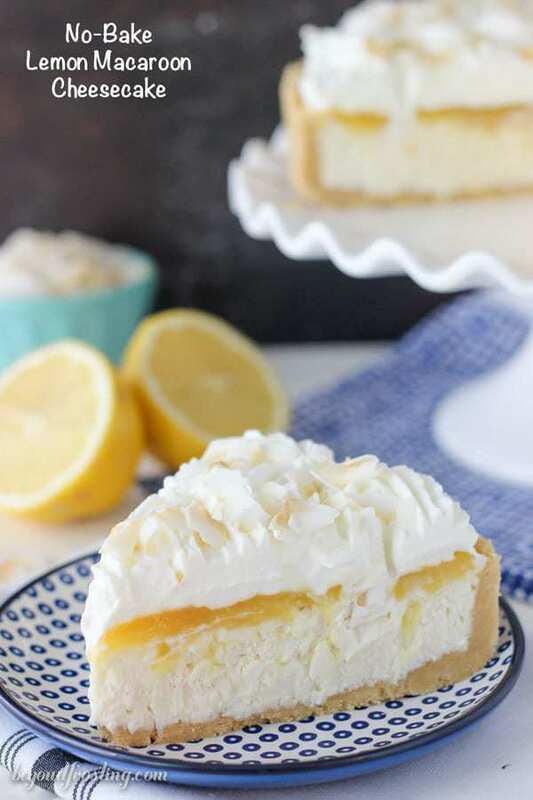 Okay okay, so this Lemon Macaroon Cheesecake it beyond amazing, and I’m not just saying that. The friends who tested this recipe said it was the most favorite one they tried. 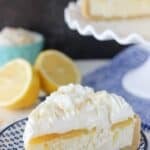 Then I asked you guys on Instagram last week which one you wanted me to share: Mexican Chocolate Mousse Pie or this Lemon Macaroon Cheesecake and you guys actually choose LEMON! I couldn’t believe it. So I made it again and brought it into work. Later that day I got multiple emails from my coworkers telling me how crazy good it was. It didn’t last a whole day in the fridge because it was gone so fast. This recipe was a inspired from a menu I saw last year when I went to Seattle. I did some serious dessert research there! So what’s in this cheesecake? It’s a spin off of my Best No-Bake Cheesecake. The first layer is a Golden Oreo crust. 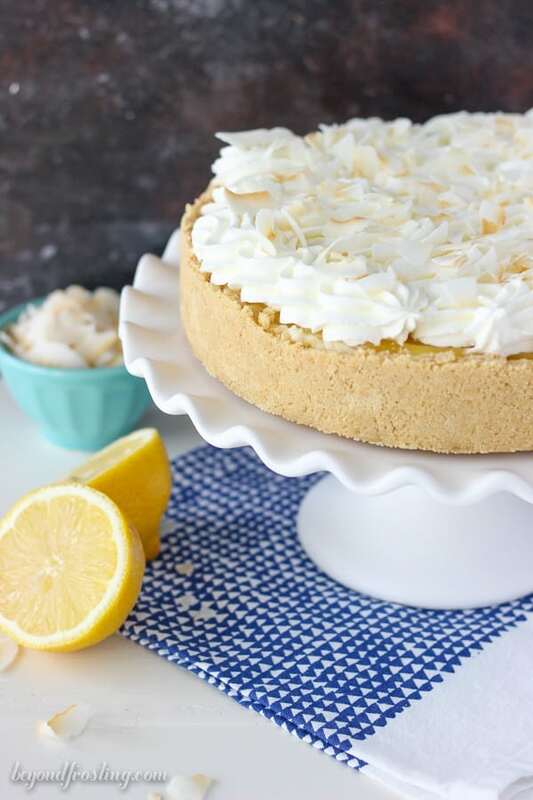 The next layer is a loaded coconut cheesecake sweetened with white chocolate. Then you’ve got a thick layer of lemon curd. You could make your own, but I picked up a jar at the store because it’s so convenient. The lemon curd is usually on the shelves with the jams and jellies. Then it’s covered with a very generous layer of whipped cream and some flaked pre-toasted coconut. Go ahead and sink your fork into all those layers, I dare you! You guys, this dessert is really quite simple. You can make all the layers at the same time and then pop it in the fridge for all the layers to set. I usually wait about 3 or 4 hours before slicing, but you can definitely make it a day ahead of time. That is the best thing about no-bake dessert. You can prepare them ahead of time so that you don’t have to worry about it. 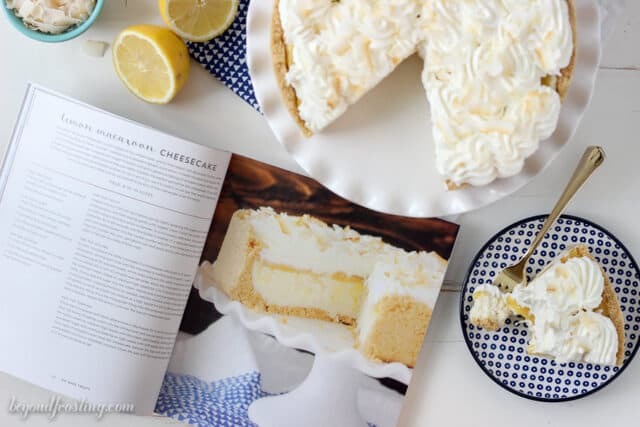 Be sure to check out all 12 no-bake recipes my friends are sharing from my cookbook! 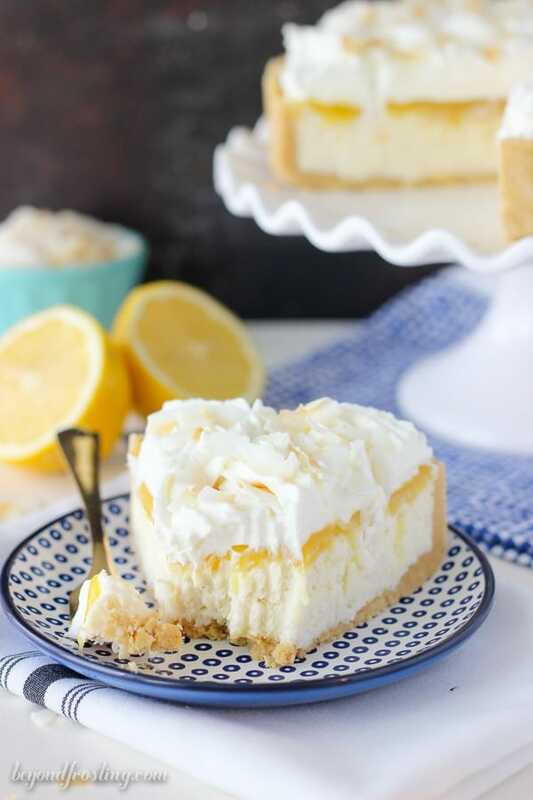 This No-Bake Lemon Macaroon Cheesecake is layered of golden Oreos, coconut cheesecake, lemon curd and whipped cream. 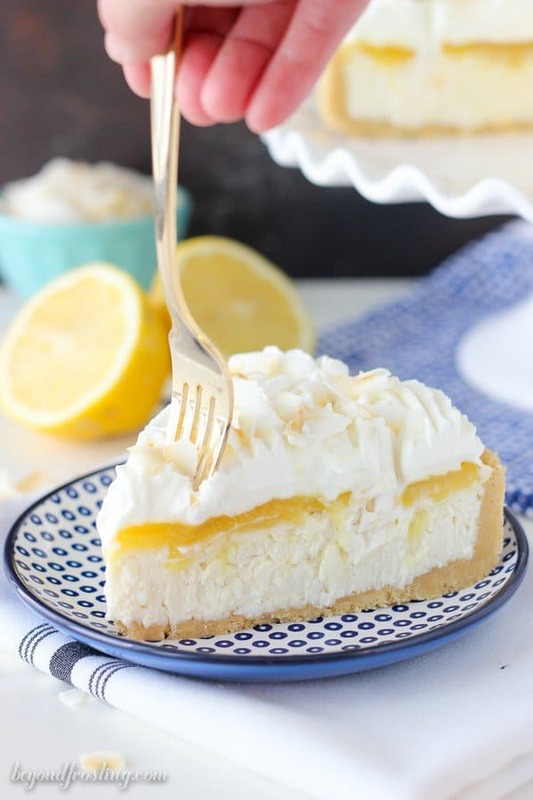 The combination of the coconut and lemon is undeniable! All of this is done without turning on the oven! For the crust: Prepare a 9-inch (23-cm) springform pan by lightly greasing the edges of the pan with cooking spray, and then wiping gently with a paper towel. Grind the cookies into fine crumbs using a food processor or blender. In a microwave-safe bowl, microwave the butter for 45 to 60 seconds until the butter is melted. In a separate medium-size bowl, pour the melted butter into the cookie crumbs and stir until there are no dry crumbs left. Pour the crumbs into your springform pan and press firmly into the bottom and up the sides of the pan to create a thick crust. For the filling: To melt, microwave the white chocolate in a microwave-safe bowl in 15-second increments, stirring each time until the chocolate is melted and smooth. I suggest microwaving at 50 percent power, which helps prevent the white chocolate from seizing. Once melted, stir it until it’s smooth and set aside. Allow the chocolate to cool. Beat the softened cream cheese on medium-high speed for 2 to 3 minutes until it’s light and fluffy. Slowly add the sugar into the cream cheese and continue beating until the sugar is incorporated, scraping the bowl as needed. 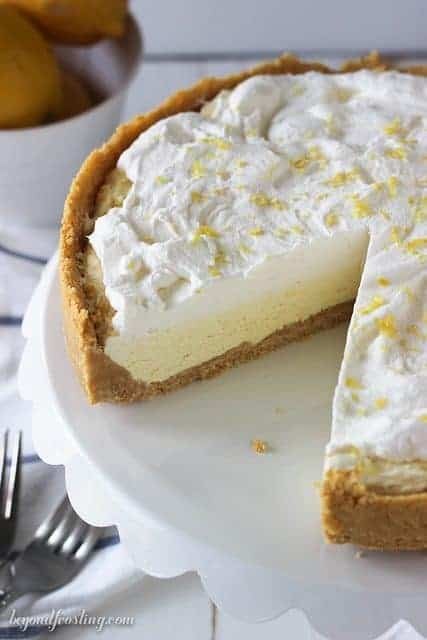 Add the melted white chocolate and shredded coconut, and beat the mixture at a high speed for 60 to 90 seconds to create a nice and airy filling. Pour the cheesecake filling into the prepared crust and spread evenly with a spatula. For the topping: Place the mixing bowl and whisk attachment in the freezer for 5 to 10 minutes to chill. Pour the heavy whipping cream into the chilled bowl and use an electric mixer to beat the heavy cream on medium-high speed until the cream gets bubbly. Slowly add the powdered sugar and continuing beating on high speed until stiff peaks form. Add a nice thick layer of whipped cream atop the cheesecake. Garnish the top with large, flaked pre-toasted coconut or shredded coconut. Cover the pan with foil and refrigerate for 4 to 6 hours to allow to set. Congratulations on the cookbook. And that looks really yummy! Congrats on the cookbook release, that’s wonderful! It looks fantastic! Congratulations again Julianne! Your cookbook arrived yesterday, and I am still reading through it. So many delicious treats! Thank you So much Joanne! You’re the best. This post’s recipes look delicious as do all of the ones in my No Bake Treats cookbook that I got in the mail yesterday! I am so excited to try so many of these recipes!!! I was a little disappointed that my “autograph sticker” wasn’t there…I guess they didn’t get the request or maybe I did it wrong, but even still, the book is “so delicious”, that it is fine. Congratulations again on all your hard work paying off! Hi Vicki- Thank you SO much for purchasing a copy of the book. I sent you an email, but just in case you didn’t get it, I wanted you to know that your bookplate will be sent separately in the middle of August. They are not shipping from Amazon or anything like that. I didn’t get the bookplate, but it’s ok. The book works just fine without it! Hi Vicki, please check you email. thanks!